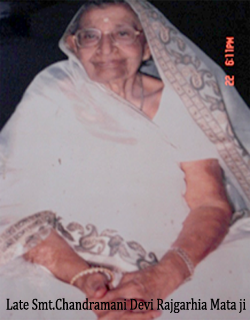 The founder of Ayodhya Eye Hospital, Late Mrs. Chandramani Devi Rajgarhia Wife of Late Shri Chandmal Rajgarhia, hailing from Giridih district of Jharkhand State in India, was born in an industrialist family of Kolkata. When God Sri Ram appeared in the heart of Mataji she established Thakur Ji and got built a grand temple of Sita Ram in 1986. Worship and help to the poor and the destitute became her only mission of life. Mataji assisted the poor and the destitute with food, clothing and even housing. She also provided financial support to several educational institutions and thus promoted education. For management of the temple, she formed a society Mani Mandir Sewa Nyas Samiti which was registered under the Societies Registration Act, 1860 on December 20, 1993. Initially, the society lacked funds for construction and running of the temple. 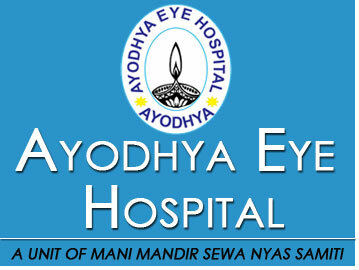 For human service by providing eye sight to the blind, a 16-bed Ayodhya Eye Hospital was constructed in 2001 by untiring efforts of Mataji. The hospital got an associate in the form of Sightsavers, UK, on October 7, 2002. Thus, Mani Mandir Sewa Nyas Samiti and Sightsavers, UK, came together in helping the campaign for reducing avoidable blindness & quality eye care to the poor and the destitute.